Google today distributed a bug-fixing update to the Android O beta. The small patch, weighing it at about 55 MB, is meant to smooth out some performance issues present in the initial build. People enrolled in the Android Beta program should see the fresh update hit their devices shortly. 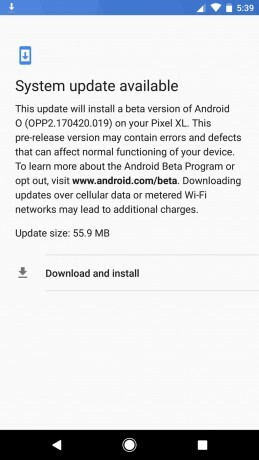 The Android O beta works on the Pixel, Pixel XL, Nexus 6P, and Nexus 5X. Google today expanded the number of third-party smart home apps that can be controlled by its Google Home product. Owners of Google Home can now control Belkin Wemo and Honeywell smart home products via Google Home. Google today made it possible to view web-based virtual reality content through its Chrome browser. The latest version of Chrome for Android devices supports VR, and Google says a number of its partners have begun to add VR content to their web sites. Google today kicked off a teaser campaign for a phone-based announcement that will take place on October 4. The company launched a web site with the address of madeby.google.com, and it specifically asks people what they want from their phones.